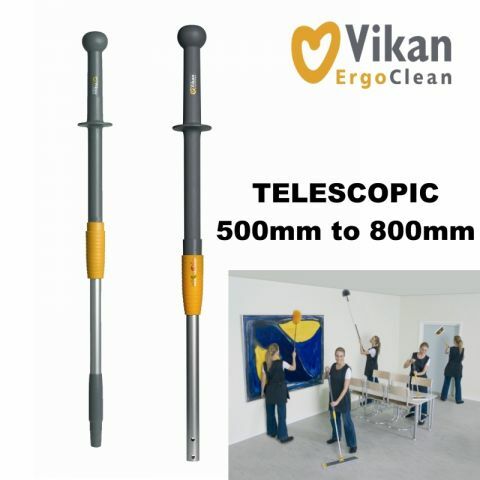 Vikan has designed an entirely new series of ergonomic handles for professional cleaning. The whole series is characterised by its light weight, its ergonomic grips correctly dimensioned to the hand, and its comfortable insulated surfaces. They are robust and easy to clean. The height of the telescopic handle is easy to adjust. The lock is sturdy and long-lasting. Handles with click fit are used together with Vikan ErgoClean's new 25cm mop frames for e.g. washing and drying boards, walls and tables. The handles have been developed in collaboration with Occupational Therapists and have a long insulated grip of impact resistant material that is comfortable to hold. The hand support facilitates work on vertical and high surfaces. The top of the handle is moulded to fit the palm, allowing workers to exert extra pressure.